I always find it interesting that the idea of “paradise” usually involves a warm climate, beach, leisure, etc. My idea of paradise is a little different, but the ideals of peace and beauty are the same. 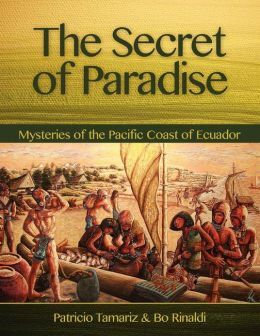 The Secret of Paradise by Patricio Tamariz and Bo Rinaldi is an informative book that certainly inspires one to want to visit Ecuador. The Secret of Paradise presents the deep and profound truth that we as human beings can live together in harmony with nature and each other. These secrets are most evident in the rich culture, beauty, and history of Bahía de Caráquez, Ecuador, which is the central area of the country, where The Secret of Paradise presents the deep and profound truth that we as human beings can live together in harmony with nature and each other. These secrets are most evident in the rich culture, beauty, and history of Bahía de Caráquez, Ecuador, which is the central area of the country, where Patricio Tamariz lives, works and has found the inspiration to create this work. The Secret of Paradise focuses on the Pacific Coast of this rich and colorful nation, and as soon as I met Patricio and his family in 2011, I knew he held the secrets of the past and the keys to our future and that we needed to share these with everyone. Being a best-selling and widely published author and entrepreneur, I immediately knew we had a message that the entire world needs to know. You have now found the keys to this secret, and we believe that by knowing these, your life will be forever changed as well. I truly appreciate the historical background in this book and the “discovery” of paradise. The account of early explorers and cacoa beans is fascinating, which they called almonds. This is definitely a intriguing book I hope to spend more time reading and eventually visiting this paradise of ecotourism!